This was a quick and easy lunch I tossed together. I came across the spinach artichoke dip/sauce while out shopping this past weekend. The sauce/dip is surprisingly low in fat and calories…yay! 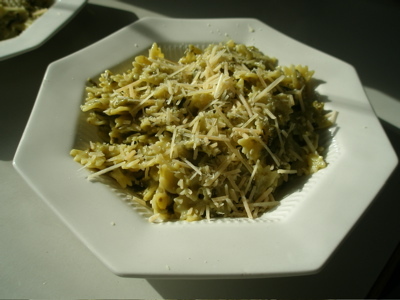 For the pasta I used Barilla’s tiny bow ties – I love them in meals – they cook up quickly! Bring a couple quarts water to a boil, add in the pasta and cook according to directions. Drain pasta and toss with dip and a couple Tbsp of cheese. Plate up and add more cheese on top.